Looking Forward to a Good Night? Get Snuggly with new Child of Mine by Carter's PJ's! My baby boy is growing up! But he hasn't abandoned his nighttime routines, which include a bit of nursing, some cuddling, a quick game of peek-a-boo, and finally rocking to sleep. We were blessed to try out a pair of the newest PJ's from the Child of Mine line made by Carter’s. He looked like such a big guy in his new jammies! The collection has been designed exclusively for Walmart, so you won't find them in any other store. They are soft, durable, colorful, and wash well. With sizes from preemie to 6x/7, you'll also find that you can get many years of wear from them! While we sampled the pj's, you can find the same adorable designs (like the dino pattern on this PJ set) in items like outwear, tees, shoes, and accessories. The spring collection is especially exciting, because it features some really innovative design traits, such as cute sayings and glow in the dark! Manny really likes to lounge in his "Dino Roars" 3-piece set, which includes a long-sleeve top and pants (perfect for chilly spring mornings) as well as a matching short! This PJ set is just the big boy look we are going for, but with features and fit that I would expect from a baby's outfit. 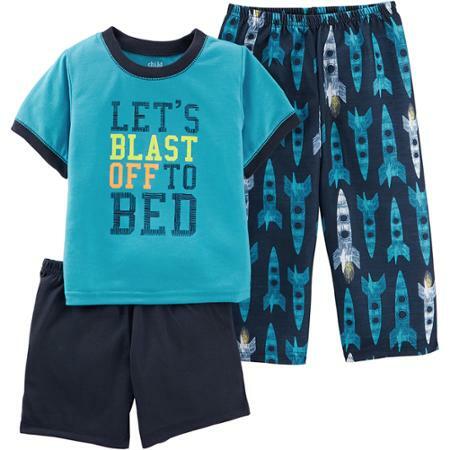 Other designs include this rocket "Blast off to Bed" set -- also priced at under $10! Whether your kids are strictly pj's at night kind of kids, or you let them wear them as lounge wear for weekends and sick days, you'll want more than one set of these in your home, I promise. I can't get enough of the soft material. It's just so soothing and cozy for little one's skin!